Cancun, Mexico | What is the real name of this hotel? Regular Rate $2497 . Today Only $599! BRAND NEW!! Welcome to the newest, most exotic and luxurious resort in Cancun! The 5 Star Cancun Villa Resort, where Mexican hospitality meets classic Caribbean relaxation. We invite you to visit. . . but your senses will beg you to stay. The 5 Star Cancun Villa Resort, Where Paradise is the Routine. Enjoy stunning views from the 1200 square foot One Bedroom Suite, tastefully decorated and outfitted down to the last detail. Perfect for a romantic honeymoon or effortless getaway, this Suite boasts the opportunity to relax and rediscover yourself with the mesmerizing turquoise Caribbean Sea as your backdrop. 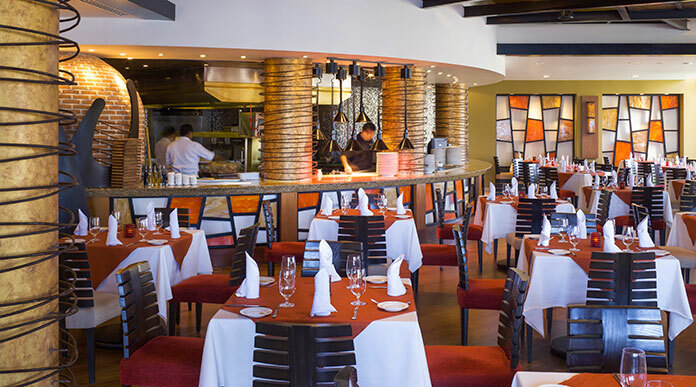 The 5 Star Cancun Villa Resort is an ocean front resort featuring Italian, Mexican and International Cuisine at Davino and Zama Restaurants and Bites Grill; it also features an al fresco lounge, the Palmita Market, a Tiki Beach bar with swings and a poolside bar. Wired high-speed Internet access is available. the 5 Star Cancun Villa Resort features an outdoor swimming pool, outdoor jetted tubs and a fitness room. Business services and currency exchange can be provided. Onsite parking is complimentary. Luxury Suites 4 Times The Size Of A Normal Hotel Room! My girlfriend and I recently visited the Villa Del Palmar Cancun. EVERYTHING about the resort was fantastic. The suite was beautiful, and had everything you could possibly need (plus much, much more). Housekeeping and room service were timely. The restaurants were both delicious and inventive; offering beautifully presented authentic Mexican dishes. Enjoy the stylish modern design and spacious layout of this Luxury Suite, complete with oversized private balcony and hammock. Tastefully decorated, this airy room comes furnished with one king or two queen size beds, an en-suite bathroom with shower and tub, a fully-stocked wet bar, a large flat screen TV and stainless steel appliances. We're very excited to be at this beautiful resort. We came on a fantastic package from Bookvip and I would absolutely use them again to travel in the future! If someone would have told me when I booked this, how wonderful it would be here... I would have told them they were lying. My family and I have enjoyed ourselves immensely. What a fabulous trip! Thanks BookVIP. This has been one of our best vacations. The staff and everything else was great. This is one of the best all inclusive resorts that I've ever had the privilege of staying at. The food is fantastic. The best hotel staff ever. Beautiful facilities and beautiful rooms. The most clean rooms I've ever seen. I booked it all on BookVIP and it's been the best vacation. 100% relaxing! This is such a beautiful place. Incredibly relaxing. The food is wonderful and I would recommend it to anybody. If you like sand, sun and to be waited on endlessly, then this is the place for you! ""Beautiful Resort - "we will be back""
My Wife and I visited this Resort for the first time from 1/13-1/19/2014, and it was a Dream Vacation. Our room was a 1 bedroom suite and we had great accommodations with great service.We went all inclusive and had the buffet breakfast every day at Davino's. We also had Dinner their each night and had excellent waiter's especially Fransisco who gave us such good service we would ask for him daily. The grounds were always kept clean and trimmed as we would always see some one working to improve. The pool's and beach were excellent and always had someone waiting on you if you needed any refreshments. We enjoyed the closeness of the Ferry Boat that will bring you on a 45 minute trip to Isle Mujeres. The charge was 40 pesos per person each way, and we spent the whole day on the Island. Fantastic Resort! "Looking forward to visiting again"
What a lovely property! We were very well looked after no matter where we went in the resort. The room was beautiful with everything that you could ever need during vacation...fully equipped kitchen, washer & dryer, jacuzzi in the bedroom, 2 bathrooms etc. The restaurants were all excellent...Steak House, Mexican Restaurant, Mediterranean and Sushi...breakfast Buffet was great every morning too. The service was excellent everywhere and in Palmitata Market we were given service above our expectations! It is a little bit away from the Hotel Strip of Cancun (about 10 minutes by cab), but the hotel has several shuttles that take you to various places during the day and evening. "NICE HOTEL BUT BIT FAR FROM CANCUN"
I went at Villa del Palmar,with my son on January 6 until the 13th.It's a very beautiful resort.Wish we had better weather.The staff at the restaurant are verry friendly,Martin at the Hiroshi restaurant speak french whit us.The waiters at La Casona STK was verry class.The bed on the beach;wow,the service at the beach is excellent.All the staff as this resort smile and are thoughtful. There also nice pools.The room service was excellent.I wish, I will return at Villa del Palmar soon. Overall a great experience. I cannot say enough about the great service. Dulce, the hostess at Hiroshi, knew the wine we liked and would have a bottle chilled when we arrived for our reservation! Susana and Frieda are smiling, congenial hostesses. Willi and Jorge took great care of us at Davino's for breakfasts. Miguel, Luis, and Noe were exceptionally attentive at Zama's. At the pool Margarito's ability to handle people and potentially unhappy situations was exceptional. People like him deserve to be promoted, and he probably will be, but it was great to have him in our area for 1 year. Merily and Giovani were always cheerful and tireless despite the large trays of food and drink they were constantly delivering. The bartender in Davino's gets the thumbs-up for the best Margaritas, but the waiters and bartenders were all attentive and energetic. Especially liked the "Omelet" guy and lady in Davino's! The food overall was very good but the Japanese sashimi dishes in Hiroshi were as good as it gets! The rooms were spacious and well appointed. We own Hyatt and Marriott timeshares but they don't come close to the size of these. It is away from the "Hotel District" and Cancun centro but we were not interested in the "night life" and the meal options at the resort were numerous and excellent. We took a trip to Chichen Itza, arranged by the hotel, for 2 couples, with a driver and guide. It cost more than the bus tours, but well worth it. We were there before the bus tours arrived (no crowds), had a great personal tour, and were home by Happy Hour! It was great. The only "downer" was the 5 days of rain during our first week. With such nice rooms, numerous restaurants, and good books we were fine. So pleasantly surprised to find this jewel. It's large but feels intimate because of the way it's designed. That includes the lobby and especially the pool area which is broken up into nice sections. The service was wonderful and the patrons ranged from young families to senior citizens and not too many intoxicated singles although a few made it interesting and didn't bother anyone. The restaurants were delightful and with a reservation, you could order off the menu even all-inclusive. the drinks were not watered down, breakfasts delicious. Try the jugo verde. Our favorite waiter was Juan in Davino's. He was efficient and so much fun. The other feature is the ferry over to Isla de Mujeres. Been there, done that, saved money on the boat trip. Ths place is off the beaten track but they do offer free shuttles to the shopping centers (IF you want that). We just wanted to relax a few days and this was Perfect. Night shows were not spectacular but just kind of a nice bonus. Kid friendly too. Only suggestion is a paperback book exchange would be nice. "Great deal, Great beach, Great food." Would definitely recommend the all inclusive package at Villa del Palmar.We were really impressed by the selection and quality of the food - much better than typical all -inclusives. The beach is really beautiful- white sand, pretty clear water. The pools were also really lovely and there are tons of jacuzzis.We got upgraded to a suite which was huge and really clean. The weather was pretty terrible while we were there so we had to spend a lot of time indoors and there wasn't much to do, but if you get good weather, this place is fantastic. Would definitely recommend taking the ferry from the resort to Isla Mujeres 45 mins away. Rent a golf cart and go see the Mayan ruins in a sculpture park overlooking the ocean. And eat at Cubano- delish. I spent four nights at this lovely resort over Christmas with my adult daughter and husband.The grounds and pools are beautiful, tropical and well kept. It checked all the boxes for a relaxing beach holiday. The pools are beautiful and the beach was very nice. We could always find chairs .I found the service to be good with a very friendly wait staff. Reservations at the restaurants had to be made the morning of, which would be my only complaint. It's away from the hotel strip of Cancun, but just what we wanted. We really enjoyed our day trip to the beautiful Isla Mujeres. It's just a very short cab ride to the fast ferry pier. The island is colorful and fun - a nice get away to drive golf carts all over the island, shop and try some local food. This would be a great place to visit with children also. Our family of 4, parents with two young adult children in their 20's, just returned from a 6 day stay at this resort. The resort was beyond our expectations. 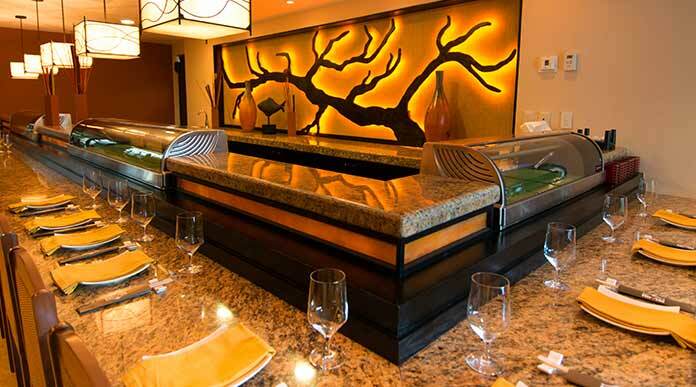 Don't let the lobby sway your impression of this resort. (It really is nothing to look at). Go beyond the back doors and enter a tropical paradise. Multiple pools and jacuzzi's to choose from so you never feel crowded. We had (2) 1 bedroom suites and they are beautiful. All marble flooring, high ceilings, beautiful glass and granite furnishings. Fully equipped kitchen, stocked full size refrigerator with drinks and snacks daily. Two bathrooms per suite. Bed linens are just like their pictures. Beds so comfortable. Huge terrace with glass table, lounge chair and rope hammock. Sit side ways or you'll never get out of it. We overlooked the pools and had a small view of the ocean. We were on the 3rd floor. I would ask for a higher floor for a better view. The meal plan was phenomenal. 4 restaurants to choose from and loved them all. All inclusive had very few limitations. We ate and drank our way through the vacation as it rained everyday except for 1. Staff went out of their way to make sure you were pleased. Davino's had alot of variety and Francisco was outstanding server. La Casona was good but not great.Tenderlon not American standard. Hiroshi restaurant had great appetizer foods as we ate our apps there and then went to dinner elsewhere. DInners looked awesome.. Zama restaurant we all loved the fish tacos, pork tacos and everything else. Fresh guacamole on every dish. Alll of the outdoor bars are open till 11pm and then inside lobby bar till 1pm. Great drinks and they do not skimp on the alcohol. They keep them flowing.Try the two outdoor bars with swings. Feel totally safe walking around here at night alone. Outdoor lighting around the pools really highlights the grounds. Immaculate everywhere. Even the bathrooms are immaculate and everything is high end. All stone and granite. The shuttle is first come first serve and only runs a few places at certain times. 10-4, etc: We had reserved spots one day and still did not get on the shuttle, as one broke down or stuck in traffic.Two different reasons given. If you want to come back when you want, the taxis are expensive. $25.00 usd one way. A month left after i visited this amaizing hotel .... but still have alot of great memories . Hope to come back at this place. A hotel is big and still building .... it looks like an oasis of nature, a great work of landscape designers . There are lots of restaurans inside - so every taste can be satisfied. Japan ( for me was the greatest one ) , also greek-italian , mexican, steakhouse .... The rooms are big and spacious with the own kitchen and hammock at the balcony . everything is clean and great style . The staff are nice and friendly, polite ,always help u and they do their work just awesome . love the place ,people and atmosphere. We just spent a week at this resort, over New Years. Had a really nice time. Bought a promotional deal from World Wide Vacation really cheap and paid to upgrade to a 1 Bedr. Ocean View Suite. All inclusive except a few exclusions we didn't find out about until long after we bought the package. No matter what, we got a REALLY good deal compared to what the resort really cost. Our suite was huge, very clean and modern, looked brand new, view from 5th floor amazing, balcony alone was around 200 sq. ft.The pools, grounds restaurants and beach area are very well kept and beautiful. Yes, the beach is kind of small, but we like that, not very far from your chair to the water, yes there is seaweed, but it's the ocean, it has seaweed! Brought lots of small dollar bills from home and started tipping right away for drinks and food. Service was excellent and we were greeted by name everywhere. There was alot of families with kids at the resort and noisy at times, but there was alot of grounds so it didn't bother us. Nothing really to do at night other then dinner and drinks, but that's fine for us on this trip. If you want action you have to go to Cancun or stay close to Playa Del Carmen. Would love to go back again! My husband and I stayed here for 5 days in November 2013. This resort is only 3 years old so everything is brand new. Our room was a standard room with king bed (nice mattress), small kitchen area with sink, counter and small fridge stocked with waters, sodas, beers and chips and nice bathroom with a cool tiled shower/tub. Every balcony has a hammock which I loved to swing in and read my kindle. I can't say enough about the staff. They catered to your every need. When I would tell them thank you, they always put their hand over their heart and would say my pleasure. We did the all-inclusive package so we never had to leave the resort. The food at the Mexican and Greek/Italian restaurant was very good. The buffet for breakfast had so much food to pick from so you can always find something that you like. Drinks weren't very strong but we just asked for a double next time and it was fine. Pools were lovey and the jacuzzis were even better. Beach was just steps away. The water here is much calmer compared to the water on the hotel zone side. It did downpour for 2 days straight but we just hung out in the jacuzzi and drank. Had such a wonderful vacation here. Although this resort usually caters to an all-inclusive package, we chose the non-inclusive at a great rate. We had other things to do in the Cancun/Playa del Carmen/Tulum area, so an all-inclusive package would have been wasted on us, but the room/breakfast option was perfect. The entire place was perfect for us, super-clean, new and inviting. The nightly shows near the pools were great. But my highest praise is for the restaurants. One of the meals I had there was probably one of the best tasting meals of my life (The Pesca Del Dia - fresh fish of the day). I can't stop thinking about that dinner. The room was fantastic, especially for the price we were paying. The only downside I can possibly think of is the location: great for someone who will spend more time on the resort, but a little out of the way for daily activities farther down south near Playa del Carmen. I give Villa del Palmar an A+ rating. "If big all-inclusive restorts are for you then - Awesome"
We went the week before Christmas and it was great escaping the cold for a little while. located in Playa Mujeres it is a great find. Only 20 min. from Cancun but for those looking for something a little different from the noise and craziness this place is great. We stayed in a one bedroom and had the all-inclusive food package and I have to say both choices were amazing. Two nice big rooms with a great porch with a two-person hammock. The food was great. We loved the bite bar and our favorite of the restaurants was the Mediterranean one. The tenderloin over polenta was to die for. The risottos were great too. Our stay was also great because we avoided all the in-season craziness by going just before the holidays. Place was not crowded which made the whole experience nice. No problems making reservations for dinner which I have read can be a problem. Had a wonderful couples massage and highly recommend the spa. Finding free lounge chairs by the pool or on the beach were no problemo. !00 yard walk to the ferry that takes you to Isla Mujeres which is a must see. Punta Sur, turtle farm, and fun on the golf cars. Some great food there too. I highly recommend all of it. We had a wonderful stay at the villa del Palmar. My family consisted of a 20 month old girl and my husband and I. We had a one bedroom suite that was to die for! How can you complain when you have a separate area for your child to sleep in so we didn't have to go to bed when she did. Also laundry machines in room were very handy. The staff is very hard working! They took great effort to learn your names and very accommodating with the toddler. Albertoico at the bar was wonderful. Regular Rate $ 2497 . Today Only $599!